So you just bought the latest and greatest super-thin 3D HDTV, thinking you are now state-of-the-art. Think again. Here comes (maybe) Ultra HD, also known as Super Hi-vision. This format, proposed by NHK (the Japanese equivalent of PBS), offers 16 times the resolution of today’s high definition TV. That is 7680 x 4320 pixels, about the same as IMAX. A 2-hour movie in this format will require about 24 terabytes of data without compression! In addition to the video, up to 24 audio channels can be used. You might start thinking about where you are going to place those 24 speakers. 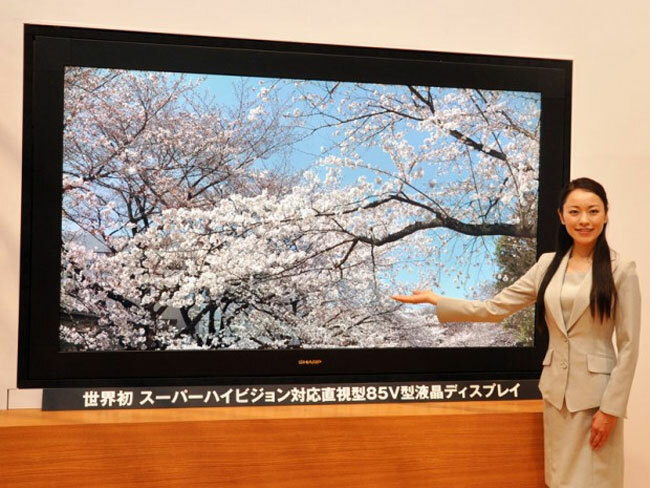 NHK expects to broadcast in UltraHD by 2020. In the meantime, a few companies have prototyped systems that accommodate the format. For example, Sharp has built an 85″ Ultra HD set. To confuse matters further, some companies are looking into an in-between technology called QFHD (Quad Full High Definition). This technology increases the pixel resolution by a factor of four rather than the 16 factor of Ultra HD. The resolution is 3840 x 2160 pixels. Samsung showed off a prototype TV display for QFHD at CES, and Toshiba will be selling a 55″ QFHD set called the Regza 55X3 this year priced at about $12,000. Although it is being sold in Japan and Europe on a limited basis, it is not clear that an American audience will pay that price. That set, by the way, is autostereoscopic, meaning that you can see 3D without glasses. Although there is no 1D content yet in QFHD format, Toshiba uses it by showing the two stereo signals needed for 3D, each in full 1080p resolution. People who have seen the display report being very impressed. In addition, the set is designed to accommodate multiple viewers within nine different regions. The television utilizes extremely small lenses to split the video feed up into two views at different angles. The user can calibrate the views using face-tracking software built into the television. Supposedly, one can be situated at many viewing angles and still see a clear picture. Satellite TV provider DirecTV has announced that it will soon be able to broadcast QFHD signals and maybe Ultra HDTV signals by switching to a new generation of Ka-band satellites that offer significantly more bandwidth than the current Ku-band satellites. Not to be outdone by the Japanese and Koreans, the Chinese television manufacturer, TCL, debuted the world’s largest 4K 3D LCD television this week at 110-inches. Offering 4,096×2,160 pixels of resolution, the television requires active shutter glasses to view 3D. In addition, it utilizes multi-touch technology to create a touch-screen on the front of the display and offers dynamic backlight technology as well. TCL is labeling the technology “China Star” and eventually plans to roll out the technology in smaller sets. There have not been any price announcements nor is it known if the sets will be sold outside of China. So get ready to toss that state-of-the-art TV you just bought. The nature of the business is that state-of-the-art is a moving target. Naturally, you will want to move with it.